First, in Revoice Pro make sure the Link switch is ON ( green, as shown right) in the destination Session window. The Link switch selects which Session window will receive any captured audio. We recommend that you name the tracks in the Revoice Pro Session to help identify the source of the transferred audio. In the example below, we've left the Revoice Pro Tracks named Audio 1, Audio 2 and Audio 3. 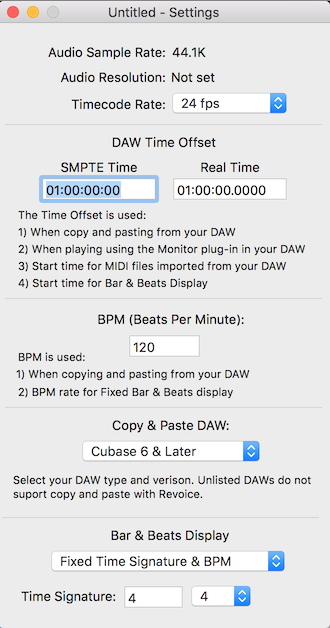 Revoice Pro's DAW Timecode Offset / SMPTE Time is set to the same Offset as the Logic Pro Project Synchronization setting. Logic normally sets this by default to 1 hour, which we also do in Revoice Pro. The Time display will show the actual corresponding running time, based on the Timecode Rate. The DAW setting does not affect performance with AU plug-ins. In Logic Pro, insert the Revoice Pro Link plug in as an Insert on each track containing audio that you want to transfer to Revoice Pro. You insert the Link plug-in into a track using Logic's Audio Fx menu as shown below. Once the Revoice Pro Link plug-in is set as an Insert in Logic Pro, it will be shown as below and be labelled with the name of Logic Pro's Track. In this example its title will be "Guides". In the picture above, the AU Plug-in header is shown. To make the plug-in more compact, click the top right hand button, which will remove the header and show only the essential controls. Note: When Revoice Pro is not running the AU plug-in will display the message "Press the Start button to run Revoice Pro". 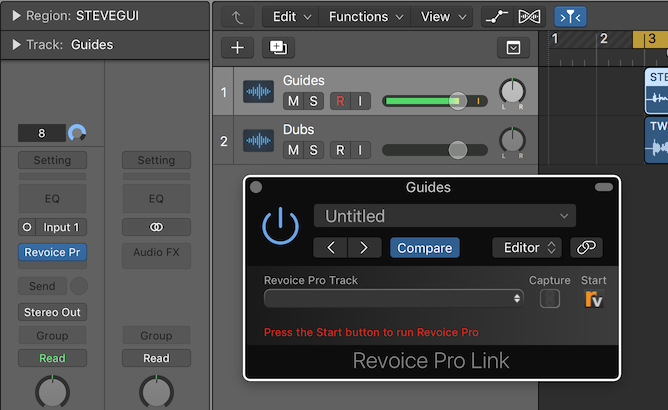 Press the Start button to run Revoice Pro. Once Revoice Pro is running, the Start button will change to Show. Pressing the button Show will bring Revoice Pro to the foreground. To select the destination track in Revoice Pro, first click the drop down bar to reveal a list of the track names in Revoice Pro, then from this list select the required track. The example below shows the selection of track Audio 1. Repeat the insertion steps and Destination track selection for each Logic Pro track that contains audio to transfer. To enable the capturing of audio, click on the Capture switch. It will glow green, as shown on the right. ALL Capture switches in visible Link modules can be toggled ON or OFF by holding down the SHIFT key and by clicking any Capture Enable switch. Below we show two Link modules with Capture enabled. Line up Logic Pro's play head to the start of the audio you wish to transfer and start the Logic Pro playback. 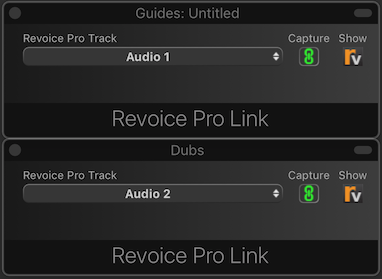 All of the tracks that have Capture enabled will begin transferring the captured audio to the selected tracks in Revoice Pro. An elapsed time indicator will show a running total of the duration of the audio captured as shown below. When all of the audio to be captured has been played, stop the Logic Pro playback. The capture operation will stop and the captured audio will appear in the selected tracks in Revoice Pro. When capture is over, all the Capture switches will automatically toggle off so you don't accidentally restart a capture. But, if you do, Revoice Pro will show overlapping audio via a Warning indicator at the right of the screen and a yellow line under the area of overlapping audio. Lastly, the area under the Link's Track selector is where any Error Messages will appear (in Red). See below,for an error message that occurs when you have not enabled the Link switch in any Revoice Pro Session window.